Well….here goes my first Blog entry ever! So excited to start this new venture. Currently I am a busy little bee coming up with items for the booth that I plan to open this Summer at a local antique mall. Starting everything from scratch mind you, a whole plethora of fun junk! Display cabinets , fun junk up cycled goodies, furniture, decorative home items, glass yard art, wall art, garden art, logos, signs, lighting, everything for my booth. My creative juices sure are a flowing! I’ve been a long time fan of the work produced by GeorgiaGlassWorks, and it’s inspired me to have a go at glass art myself! 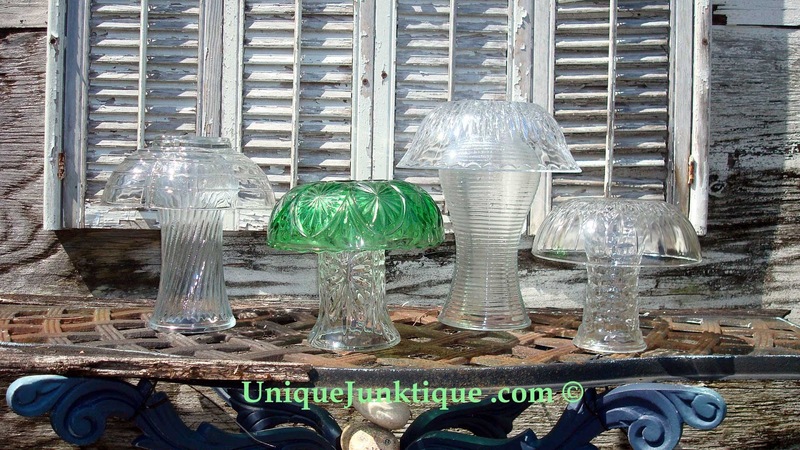 This week I’m concentrating on some glass yard art: vintage glass mushrooms, and painted vintage glass plate flowers. I’ve gotten a few mushrooms completed, have the glassware for the flowers and I’m waiting on the paints to arrive in the mail. I can’t credit this idea as my own, heck these things have been around forever, But my experience working with glass through the years, and other glass artists in the past I have learned a few coveted trade secrets along the way on how to make them very durable. I guarantee the bond between the glass pieces will not come apart, even if you drop them and they shatter the bonding site will remain intact. 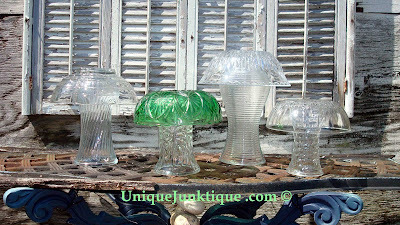 The mushrooms are made from vintage glass and crystal found at garage sales, thrift stores, flea markets and the like. Glued together with super strong UV resistant polymers, the adhesive I use will not yellow, crack or degrade from the sunlight. Hand washing is recommended as I have not tested them in the dishwasher repeatedly. If your a snowbird, and plan to put these baby’s outside up north, please remember to bring them inside during the winter as freezing temperatures will crack the glass! Be sure to keep posted for lots of eye candy to follow, as I will be posting tons of snapshots of my creations that I will be offering in my booth.